For the past few years, I've had it in my head that I wanted to try to have a beehive. Execution of this plan, however, took research, time, and a few resources that I had to procure. 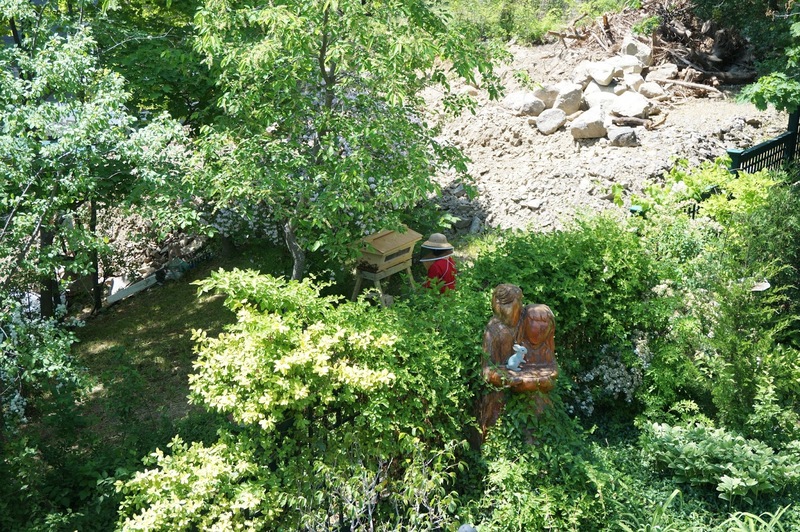 It started with the addition of a small piece of land next to our own, with the intention that it would stay wild and undeveloped. While small, it was just enough to protect us from some nearby construction and seemed a perfect spot for a hive. That happened last summer. I expected that I would buy the hive this year, let the construction finish, order the bees in the fall and get them next spring. It didn't seem like this was a thing that could be rushed. In the meantime, I learned about holistic beekeeping. I found a company out in Colorado and purchased a top bar hive. I did a lot of reading, and watching videos. On a whim, about a month ago, I checked out the site of a place in Maine that sells bees, thinking it was too late to get them for this year. All of the sudden, my plan spun into motion much faster than anticipated. I bought the bees. Gathered up supplies: bee veil, hat, overalls, gloves, alcohol in a spray bottle (in case of stings), and local raw honey to use as their food until they could get started. 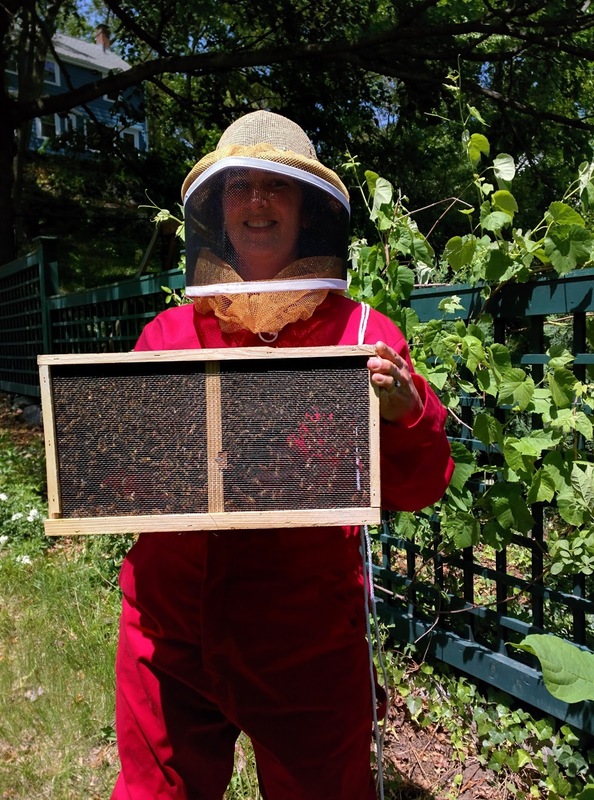 I met some lovely people, including the president of the Boston Area Beekeepers Association, who pointed me to their website, meetup, and a host of other resources. 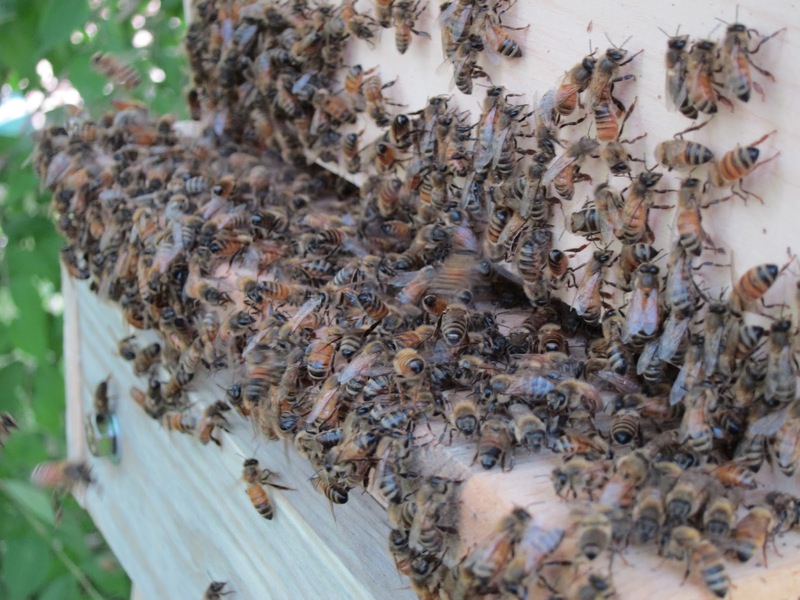 The bee community is large and devoted. And willing to share their knowledge with newbies like me. Today was bee pick up day. I drove 2.5 hours to Farmingdale, Maine. Picked up my box of bees: 3 pounds plus a queen. Drove 2.5 hours home. Got changed into my bee gear and got to work. Having read a lot of different literature on holistic beekeeping, I combined a few methods I thought would work best for me. For food, I used local honey diluted with warm water, and put it in a tupperware dish with some twigs in it, so the bees had something to perch on. I will need to feed them until they make food for themselves. From Gold Star, I had purchased a starter kit: a small piece of old honeycomb and a little lemongrass oil on a cotton ball. This oil was rubbed inside the hive. The honeycomb was wired to one of the top bars. It broke off twice. By the time it broke off the second time, I was already in my gear and the bees were out and about, so it was a lot harder to reattach it. But I managed. 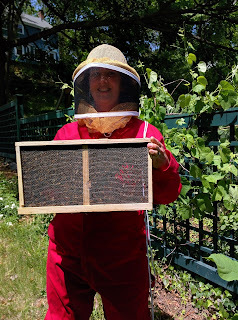 Then I put the queen, in her cage, in the hive by attaching the cage to the same top bar that has the old honeycomb. 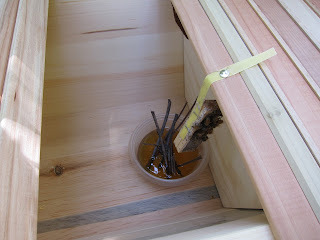 This was placed next to the false back, to encourage the bees to start their brood comb in the front half of the hive. In a few days, I will go and move the false back to the back and, if she hasn't already gotten out, release the queen. When it was time to get the rest of the bees in, I gave their box a hard thump to get them to clump together and dumped them into the hive. Let me just say: 3 pounds of bees is A LOT of bees. It's intimidating to see how many there are. They were all flying around my head, but didn't seem bothered by me in the slightest. In fact, my sleeve had slipped and I had a little skin exposed, they didn't come anywhere near. I did not get stung. Even when I went back, without any protective equipment, to watch them for a bit, they basically left me alone. One landed on my arm, walked around on me a bit, and flew away when I brushed it gently off. I didn't panic, and neither did the bees. Things may be different when they have a hive to protect but, for now, I'm pretty pleased with my progress. I am now a Bee Guardian. For the record, I have named the queen bee "Beatrix." I could make bee-related puns all day. I promise, though, that will be the only one. Great description of your plans and the day. I'm happy you didn't get stung! It IS alot of bees!! Good luck. Oh but there are so many bee puns! Good luck--and keep the buzz going.